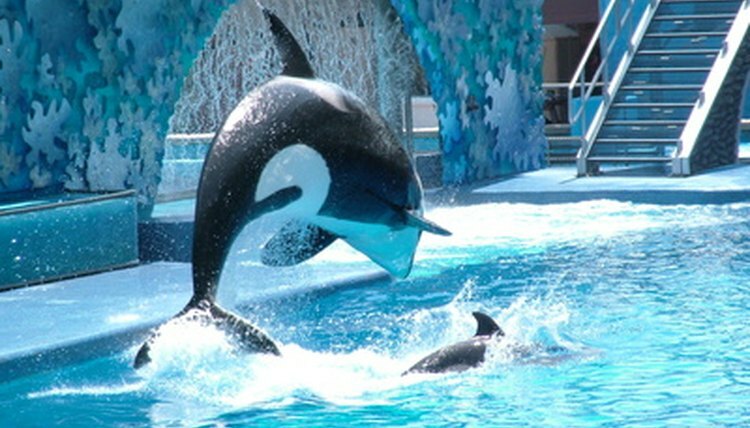 Orcas, more commonly known as killer whales, belong to the dolphin family rather than the whale family. Killer whales are the largest members of the dolphin family in the world. Adult killer whales can reach nearly 10 tons in weight and 26 feet in length. While the killer whale is not considered endangered as of 2010, some regional populations have plummeted in recent years. Conservation efforts such as those at SeaWorld are attempting to increase the number of killer whale babies born. Baby killer whales go through an extensive journey from conception to adulthood. Killer whales generally mate any time during the year. Female whales, according to Dolphins-world.com, reach sexual maturity around age 15, while males mature sometime between 15 and 21. The females experience polyestrous cycles, similar to human ovulation cycles, in which conception can depend upon mating at the right moment. In some cases, killer whales skip reproduction because living conditions aren’t prime. This can be due to food shortages, water impurities or stress. If living conditions and cycling are both ideal, conception occurs. The female killer whale gestates for approximately 17 months, according to SeaWorld. Because the whales mate any time during the year, births can occur at any time during the year as well. However, SeaWorld notes that some research suggests that certain regions have peak birth months, such as a larger number of baby killer whales being born in the northeast Pacific Ocean between October and March. Killer whale mothers give birth to live young, known as calves. Each pregnancy results in one calf born in the water. The calves are usually born tail-first, though some head-first deliveries have occurred. At birth, calves are around 8.5 feet long and weigh between 260 and 350 lbs. The dorsal fin and tail flukes of a newborn calf are flexible for several days. The area usually seen as white on adult killer whales is a yellowish color at birth. Killer whale calves nurse for at least one year, with some calves nursing for nearly two years. The milk produced by the mother gives the baby a large amount of fat in order to help the calf quickly develop enough blubber for surviving cold waters. When nursing, the mother swims close to the surface while the calf suckles from a teat while swimming on its side. This feeding occurs in short bursts of time, from five to 10 seconds, several times in an hour. The short nursing spurts happen all day, every day. Despite the fact that killer whale calves are well cared for by their mothers, the mortality rate among them is high because of several factors, including natural predators. Dolphins-world.com states that only one in two killer whale calves reaches over the age of 1. As the baby killer whale grows, it becomes more like an adult whale. The floppy dorsal fin and tail flukes harden into their proper shape. The yellowish tint to their skin fades and becomes a standard white. While calves stay close to mothers right after birth, older calves start swimming independently of the mother. The killer whale mother teaches the calf how to hunt so that it can be independent when the time comes. By the end of the first year of growth, killer whale babies can weigh around 1/2 ton and reach about 10.5 feet in length. Eventually, the time comes for the calf to leave its mother's shadow. Mothers usually care for calves for about two years. At this time, the calf becomes responsible for itself. By this point, the calf is comfortable with finding its own food and communicating within the pod. The A-Z Animals website states that killer whales can live up to 60 years. In captivity, however, whales live to be around 25 years old.